Review: Goal Planner - In Sales Now ! A few months ago, we published some post about how to set some goals but we find very important to explore a little bit more about a goal planner from one of our partners. The posts if you want to read them are: SMART GOALS EXAMPLES AND HOW TO SET THEM and . You can also find useful the post FREE ACTION PLAN TEMPLATE, after reading this article. 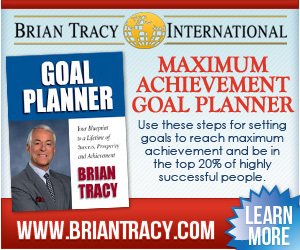 Maximum Achievement Goal Planner by Brian Tracy is one of the most useful guides I’ve ever read. It’s so good I think it can also can be called Maximum Success Planner. It provides you with lots of good topics to develop in your life. Even laws that govern your life. There are some keys to success you can learn by following this book that can help you to achieve personal and professional prosperity. I like to consider Brian Tracy my mentor, because I’ve read so many of his books, I studied lots of his audios and completed some of their trainings. This particular one helps you achieve your true potential. It’s complementary material to the one you can find in this website but if you want to find some more specific, you should by this book. This guide will help you organiza your thoughts, visualize your goals, control your mental life, write some affirmations, better your verbalization, feeding your mind, etc. This can teach you how to put these techniques together to an action plan. Just follow the 31-day process and you will find in your way to success very soon. In this program you’ll find step-by-step instructions on how to create a blueprint for lifetime of success, prosperity and achievement! Visit his website, you won’t regret it. CLICK HERE. I tried this goal planner and it is absolutely great! Brian Tracy is an spectacular salesperson but this is great for every field. Thank you for posting. I followed your advice and I think I can see the future with this planner. Hello Jack, thank you for coming to this website. If you plan your goals as said here, you can see the future because you will build it. We have to other post about goals following SMART technique if you want to read them. Take a look at: SMART GOALS EXAMPLES AND HOW TO SET THEM and SMART GOALS EXAMPLES (PART 2). I don’t care about this, now i’m earning around 5000$ a month after I used this goal planner to my financial education. Hello Grace! I’m glad it’s working for you. It’s working for me too! The thing here is how you are going to get to your goals if you didn’t planned it the best way. Don’t you agree? Thank you for letting us know this is working for you. I read this review last year and decided to try it. Now I have a complete goal plan for 2016 and I’m pretty sure I’ll succeed. There is no way you can get lost with this guide. Here in India is difficult to find such material. Hello Abdul, thank you for your comment. This is a great goal planner, actually, the best I’ve ever read on the Internet. Once I read it and tried it, I won’t use another one anymore. Glad you like and come back to tell us your success story. Great review. Brian Tracy is a great professional, and his material is great. I’ve been studying his webinar and books since I started my professional life. It’s not just about sales, is also about professional performance. I recommend everybody to read this guide and try it for their professional skills improvement. Hello Lucy, thank you for your comment. Indeed, Brian Tracy is one of the best mentors about sales and personal development in the world. This Goal Planner is terrific, I follow it every year (more than once). There is another program from him I use, maybe you want to check it: Sales Success Made Simple. I’ve just read the review and I believe it is a great book. It’s a great guide. But I see you didn’t rate with a 10 the Template part? Do you know where I can get an Action Plan I can follow? This is a tremendous tool, this goal planner is more than I expected, I really thank you for letting us know this material. I’m using it for my company. Thank you very much, Erika, for letting us know this is working for you. That’s right, it’s a great planner and I strongly believe that it will lead you to success.